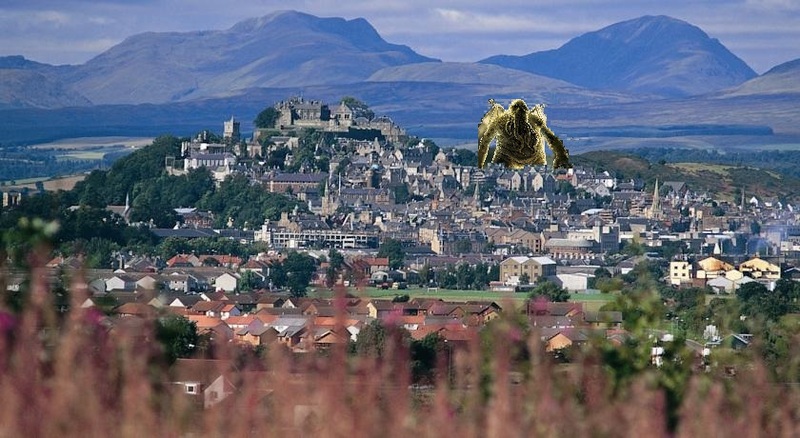 The Stirlingshire town-beast of Gargunnock has unearthed itself from its subterranean moorings and is now rampaging through the Central Belt in Scotland, causing untold amounts of property damage and traffic chaos akin to “a thousand Ts in the Park”. The behemoth Gargunnock, which was successfully subdued and buried so it could be built upon and harvested for immortal energy in the early 20th Century, reportedly stirred during the early hours of this morning due to a sacrificial ritual performed by a local branch of RISE. A successful evacuation of the town’s 1,017 inhabitants was conducted before the seismic shifts could result in any loss of life, but the monster now has uncontested rule of the Central Belt, due to all members of the United Kingdom Armed Forces being on leave because “nobody ever invades in the summer”. Towns and villages including Doune, Kippen and Braco have already been devastated by the Lovecraftian abomination’s incessant assaults, which only relented when Gargunnock took a break in mid-morning to cleanse itself of its humiliation and abjection in the Pool of Muckhart. David Cusser, the MSP for Dunblane, reported that his constituents were “alarmed” by being tormented by a monster the size of the Empire State Building, and that they were “upset” that Gargunnock has taken to eating all the foliage they hoped would win them Scotland in Bloom. Gargunnock’s previous claim to fame was being one of Scotland’s last exclusively monochrome towns. Gargunnock was converted into a generator of renewable electro-magnetism and soluble life forces after the town’s oak-spale basket industry was devastated by de-forestation, and since then the area’s electricity, fuel and water have been provided by the monster’s brain and amphibious respiratory sacs. There are now genuine fears that large numbers of the population could be left stranded after the chaos left the M80, M8, M9 and A811 gridlocked by terrified and annoyed motorists, only adding further strife to a transport system already harrowed by persistent Scotrail strikes. And this has seen much anger directed at the government, with many political figures and social media users questioning why it was that a sleepy village in the middle of the country was built on top of a massive and potentially bloodthirsty killing machine in the first place. Mrs Sturgeon was defiant as she defended the decision to retain Gargunnock, however, stating that it was crucial to the Stirlingshire area, and insisting that “the big monster going haywire doesn’t mean that all of our energy programs are going to turn on us”, despite early reports suggesting that crude oil from North Sea rigs had alien sentience.